face value 100 LEI, ROMANIA, year 19 39 written in two parts, inside an inner linear circle an archangel with spread wings, holding with both hands a sword and supporting a shield with the Romanian coat of arms legend CAROL II REGELE ROMANILOR meaning "KING OF ROMANIANS" and king CAROL II facing right. Under the neck lies the name of the engraver, E.W.BECKER. face value 100 LEI between two triangular signs, ROMANIA, year 19 39 written in two parts, a vegetal wreath beneath an equal lenght armed cross, ended with fleurs-de-lis. Above the cross a shield with the Romanian coat of arms. 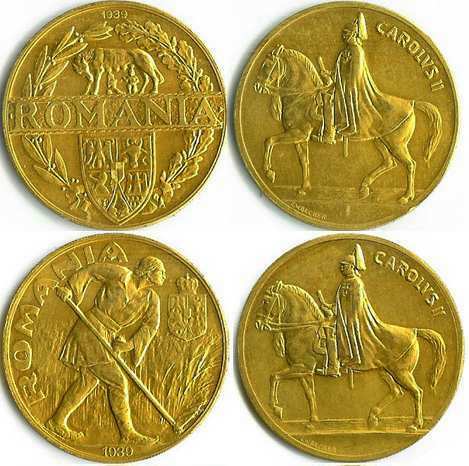 legend CAROL II REGELE ROMANILOR meaning "KING OF ROMANIANS" and king CAROL II facing right. Under the neck lies the name of the engraver, E.W.BECKER. laurel and oak wreaths, a horizontal strip with ROMANIA, above the strip the She-wolf and the twins Romulus and Remus, below a shield with the Romanian coat of arms. Atop year 1939. Without face value. along the edge the inscription CAROLVS II, in the middle the king on horseback, to the left. In exergue, along the edge, at the bottom left, the name of the engraver, E.W.BECKER. along the edge ROMANIA, Romanian coat of arms, a peasant mowing, tall grass in the background. At bottom year 1939. along the edge inscription CAROLVS II, in the middle the king on horseback, to the left. In exergue, along the edge, at the bottom left, the name of the engraver, E.W.BECKER. 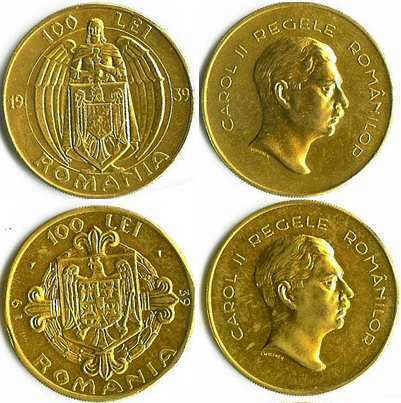 The gold coins pictures above are present on Romanian Coins through the kind permission of Mr. J. Ardelean. The six gold coins set (after some sources, there are two sets of three coins each) was struck in order to celebrate 100 years from the birth of king Carol I. It is easy to see that on the coins here there is not a single reference to Carol I to be found. In April and May 1939 the festivities for the birth centennial of king Carol I took place, on May 9th being inaugurated the statue of the first king of Romania (at Bucharest). The great gold pieces, having 41 millimeters in diameter and 42 grams, also known as the She-wolf (Lupoaica) respectively as the Mower (Cosaşul) - were defined by the coin set emission Law nr. 489 from June 1939 as decorative coins. The great gold pieces are close to medals. Based only on the leu/gram ratio, they must have a face value of 129 lei and several bani. The mower that appears on the second great gold piece is badly represented. He mows very unusually, with the scythe held with the left hand. This can be the first design error of the Romanian coins. According to Schäffer - Stambuliu catalog in 2009, the mintage of 20 and 100 lei was 91 pieces each, and 95 each for the great gold coins. In 2013 Romfilatelia put on sale a series of four stamps, under the name of "Numismatic Collection of the National Bank of Romania - Romanian Golden Coins" [Colecţia numismatică a Băncii Naţionale a României - monede româneşti de aur]. The highest value features one of the golden 20 lei from 1939. 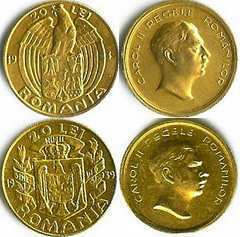 On the page describing the series on the Romfilatelia website, the information exists about the mintage of the 1939 golden coins: each of the six coins would have been minted in 300 pieces, according to this account. The site hints somehow that this information comes directly from the NBR. It is very interesting to observe that the 20 lei 1939 pieces (and the 20 lei coins from 1940, presented on the following page) have 6.5 grams. The 20 lei coins struck under Carol I (in 1868, 1870, 1883, 1884, 1890, 1906), and the coin struck in 1927 and bearing the effigy of king Ferdinand (and year 1922) have 6.452 grame. The coin-medal „Transylvania of Ours" is a bit heavier than the regular 20 lei coins, having 6.55 grams instead of 6.452 grams. The weight of the "galbeni mari" is tied to the weight of the ducat - 1 ducat weighing approximately 3.49 grams, out of which 3.44 grams of pure gold, the fineness of god being 98.6%. The 42 grams represent the weight of 12 ducats. At a fineness of 90%, "galbenul mare" contains around as much pure gold as 11 ducats. The Capitoline She-wolf (Lupa Capitolina) is a bronze Etruscan statue from the 6th century B.C., today kept at the Conservatory Palazzo in Rome. The nursing infants Romulus and Remus (mithical founders of Rome, sons of Mars, the god of war, and of the vestal Rhea Silvia) were sculpted and placed under the statue in 1509 by Antonio del Pollaio. 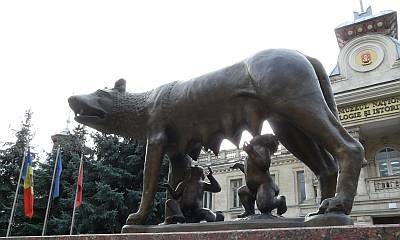 The She-wolf and the infants Romulus and Remus symbolize the legendary origin of Rome and also the sacred and eternal character of the city and of its power. The image of the she-wolf with the twins appears on many antic Roman coins. The Italian State gave five copies of this statuary group to the Romanian State, as present. These were emplaced in Bucharest (1906), Cluj (1921, Transylvania), Chişinău (1921, Moldavia, Basarabia), Tîrgu Mureş (1924, Transylvania) and Timişoara (1926, Banat) as symbols of the Latinism and of the unity of the Romanians from all the country's provinces. 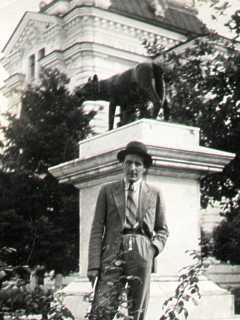 At Chişinău the statue - that can be seen in the nearby picture, taken in 1937 - was placed in front of the building where Sfatul Ţării (Council of the Land) voted in 1918 the Union with the Motherland (from 1933, the building was assigned to the Agricultural Sciences Faculty). Nowadays the building has suffered important architectural modification, housing the Academy of Music, Theater and Plastic Arts. The Russian invasion (Soviet) has destroyed the beautiful statue (1940). At December 1st 1990, a new copy was unveiled Chişinău, as donation of the Cultural Ligue for the Unity of Romanians from Everywhere. The emplacement was made in front of the National Museum of Archeology and History of Moldavia. Removed in 2005 under the pretext of restoration needs (most probably on political grounds), the she-wolf was restored in 2009 on the emplacement, as a new donation and new copy made by the Cultural League for the Unity of Romanians from Everywhere.